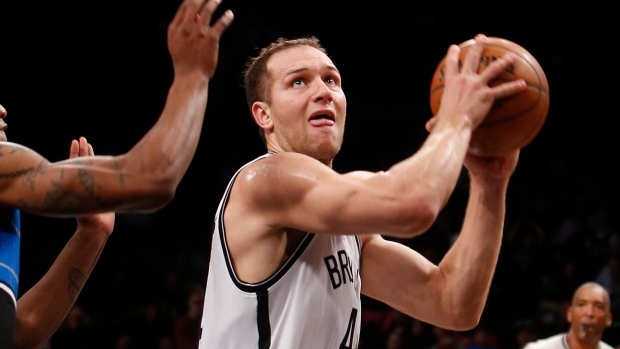 NEW YORK, N.Y. - Bojan Bogdanovic led the way for the Brooklyn Nets with a season-high 22 points. Bogdanovic's three-point field goal with 5:41 remaining in the fourth quarter sparked a Nets' 15-7 run to seal a 104-96 victory against the Orlando Magic. "KG (Kevin Garnett) found me," Bogdanovic said. "He found me on like four or five layups. I got involved in the game after I scored the three-pointer and we turned in a great game with all the offence we played." Since he arrived from overseas Bogdanovic has impressed Deron Williams. "He's a rookie, but he's not because he's played at a high level for so long," Williams said. "He's 25 years old and he knows how to play the game. He doesn't have much of a weakness. He can pass, he can shoot, he can dribble and he can post up. He's very versatile. He means a lot to this team." Williams believes Bogdanovic can produce at a high level because of coach Lionel Hollins' offensive system. "Our offence is the kind of offence where if you screen, if you cut hard, if you move, you're going to get open," Williams said. "Also, I think teams are keying on myself, Joe (Johnson) and Brook (Lopez) and he's going to benefit from that. He finds himself getting wide open shots, but he's also doing a great job of attacking the defence." Mason Plumlee added 12 points and 10 rebounds while Williams and Garnett each had seven assists for Brooklyn (4-2). Nikola Vucevic led the Magic with 27 points and 12 rebounds. Vucevic scored 17 of Orlando's 25 points in the third quarter as the Magic trailed 81-77 entering the fourth quarter. "I felt like I got it going," Vucevic said. "My teammates were able to find me for that mid-range and I had a couple rolls to the basket and I was able to finish around the basket after missing in the first couple of periods. I felt pretty good, wish we just came out with a win." Evan Fournier scored 19 points in the loss for Orlando. Brooklyn ended the game with a small lineup, which included Garnett at centre and Johnson at power forward. That lineup slowed down Vucevic, who didn't have a field goal attempt for the entire fourth quarter. Lopez sat the entire fourth quarter after failing to slow down Vucevic on defence. "Yeah, he wasn't guarding," coach Hollins said. "I want him to guard, simple as that. Get on him." Brooklyn finished with a 45-31 rebounding advantage over Orlando (2-5). Magic coach Jacque Vaughn thought that was the main reason for the loss. "We got out-rebounded pretty badly so that produced points in the paint and with us that's pretty easy to come by right now," coach Vaughn said. "A lot of times, rebounding is position, your early work. I think we can continue to address that and take care of that." Nets: Bogdanovic scored a season-high 22 points, which marked the highest scoring total for a rookie in a single game this season. Joe Johnson eclipsed the 4,000-rebound mark with his second rebound the first quarter. Brooklyn is now 5-0 against Orlando all-time at Barclays Center. Magic: Victor Oladipo (facial fracture), Kyle O'Quinn (sprained left ankle) and Devyn Marble (strained rotator cuff) were sidelined for Orlando. Oladipo wore a clear mask to cover his face during pregame warm-ups. Oladipo worked on offensive pick-and-roll offensive plays on the court and then rode a stationary bike in the tunnel. Nets: Brooklyn begins a three-game West Coast trip Wednesday against the Phoenix Suns. Magic: Orlando is on the road Tuesday for a matchup against the Toronto Raptors.